Day 1: Meeting point in Surabaya Airport, drive to Malang for about 3-4 hours, stay in a small homestay close to Bromo Semeru National Park. Day 2: Early morning breakfast continue by jeep ride to Ranupani village, the starting point of Semeru Climbing. Start to climb to camp to Kalimati (5-7 hrs/ + 2700 m asl ) Camp. Get rest after dinner, because we will start trekking for the summit attact at 12.00 am. 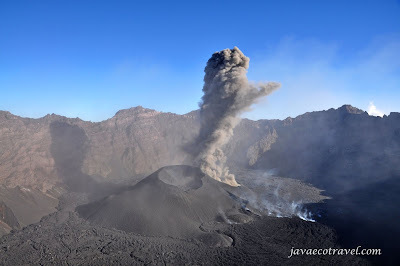 Day 3: at 12.00 ascend to the summit and possibility down to see its active crater and explosion (if condition allowing). Grade of climb will be very challenging (3-4 hrs) walk through gravels and sand. Descend to Kalimati, have breakfast then continue to the next camp at Ranukumbolo lake. Day 4: After breakfast back to Ranupani, next transfer by jeep to Cemorolawang. Rest at hotel near the rim of Tengger Caldera. Free afternoon to enjoy Bromo Tengger Caldera. Day 5: Get up early morning at 3.00 am, a jeep will take us to the sunrise spot. Enjoying one of the most beautiful volcanic landscape in Java. After sunsrise, drive down to visit Bromo crater. Back to the hotel and breakfast then drive to Sumberwaringin Village, the starting point for Raung Volcano. Will arrive on the afternoon. Day 6: Early morning breakfast then start trekking. The walk will pass through coffee plantation and dense tropical forest. Arrive at the last basecamp nearby the summit on the afternoon. Get rest and relaxing, set up a camp. Day 7: Wake up at 03.00 am, start summit attact. Enjoy the sunrise from the crater of Raung Volcano. Back to the basecamp to have simple breakfast. Descent to Sumberwaringin Village, after cleaning and lunch, drive to Ijen Caldera. Stay in a simple Guesthouse on the middle of a coffee Plantation area. Day 8: Check out at 01.00, drive fot Ijen. 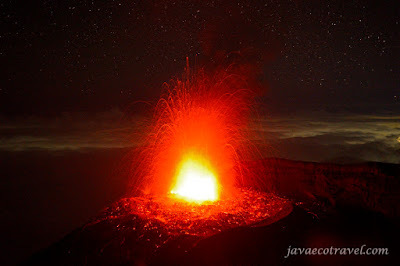 At 02.00 start the hiking to witness the beautiful Ijen Crater Blue Fire. The trekking to the crater will take more or less 1,5 hours from the parking area. We have to be at the bottom of the crater before the light come at 05.00 to enjoy the blue fire. After the light come we will witness another beauty of the Ijen Crater, the green turquoise colored lake. 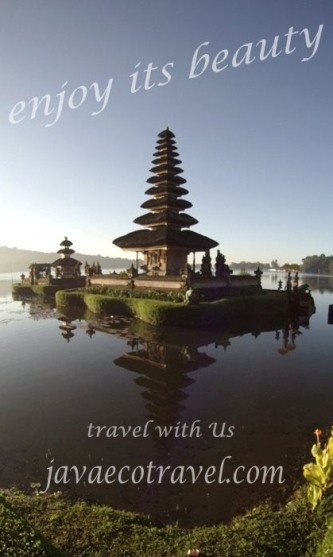 Back to the parking area, to have simple breakfast, then we will take you to Bali Island. Less than 2 hours, we will be on the ferry to Bali, by lunch time you will be at the hotel in Pemuteran or Lovina.